Welcome to coobird.net, the home of Thumbnailator, Dvaspi, Pitacalc, Coobird's Blocks, and many other projects! There has been a lack of updates for the past several months, so to make it up, here's a sneak peak of what is being developed at the moment. 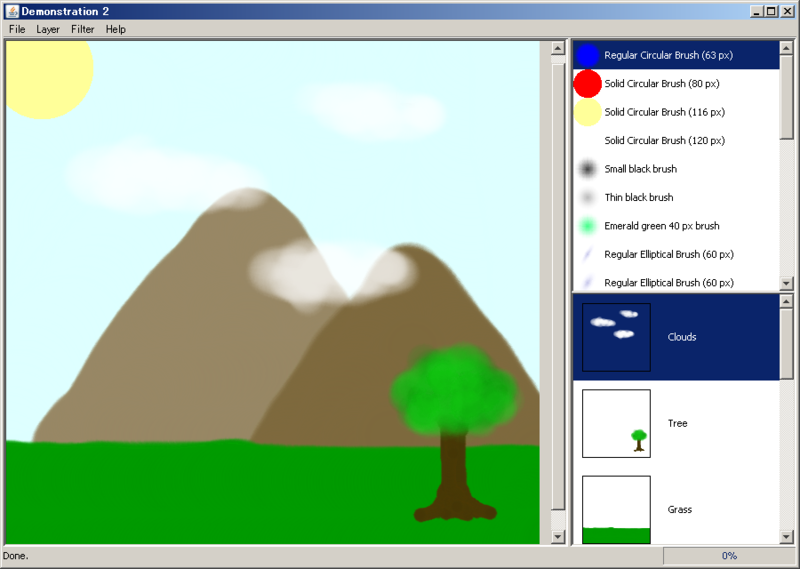 A image drawing application in Java. 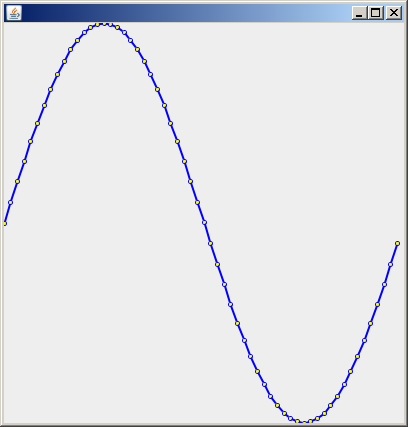 Currently in a "demonstation" phase with a interim graphical user interface, with support for brushes, image filters, layers, and input and output to image files. There have been some effort into enabling multi-threaded processing for image filters to decrease filter processing time on multi-core systems. Many basic functionality expected in an image manipulation program are still missing (such as Undo/Redo) or in development, and is more of an programming exercise than an actual image editing application at the moment. Dvaspi is being rewritten from the ground up. Support for a graphical user interface to allow display of multiple data sets. Allow for application of transformations on data sets to help in analysis. Fine-grained configuration of the visual representation of data points and lines. Possible scripting support to perform tasks in Dvaspi. Protection of original data from modification within Dvaspi via specification of mutable and immutable data sets. Export and priting of data set visualization. The image to the left shows the result of the improved data set rendering capability in the new Dvaspi. The Changelog contains the updates and modifications made to coobird.net. Updated on May 15, 2009. Also, Coobird's Blog contains information, updates and news at coobird.net. Up-to-date information on projects can also be found in Coobird's Devblog, the development blog. Blocks is a brick-breaking game which is being written in Java. It is designed to work as both an applet and an application, so it can be played both online and offline. 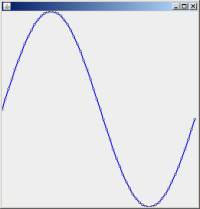 Coobird's Data Viewing and Selecting Program with Integration (Dvaspi) is a free, open source Java application which performs functions such as plotting data points from comma-separated value or tab-delimited text files, selecting the data points and copying to the clipboard, integrating with a baseline correction and many other functions. It is available as a free download. Dvaspi is open source software. It is licensed under the GNU General Public License, and the source code and executable files are available for free. The project aims to provide facilities to create high-quality thumbnails and also allowing embedding of a watermark or logo with varying transparency. Thumbnails generated by Thumbnailator can have the aspect ratio preserved or have the image rotated as desired. Thumbnailator is open-source software, available to download for free under the modified BSD license. Not the first time to write an emulator for a similar processor, it has been rewritten in Java. (The original iteration was written in C, however due to the hard drive crash mentioned earlier, it is also lost.) The processor supports 16 instructions and 4096 memory addresses. The instruction sets is based off of Donn Stewart's Home-built TTL CPU. This project has been dormant since July 2006. This project has been dormant since April 2007.